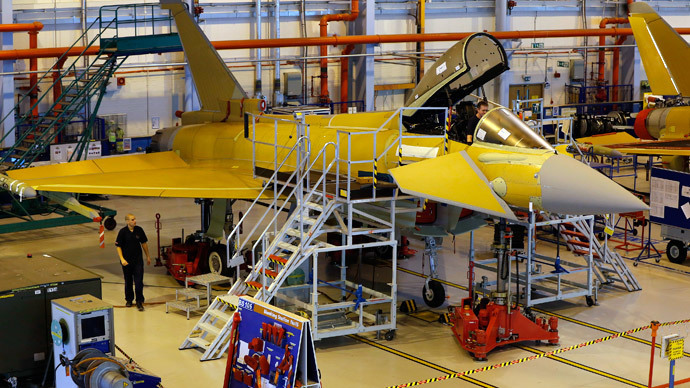 Arms manufacturers currently have dozens of employees seconded to the Ministry of Defence (MoD) and other British government agencies, an investigation has discovered. The revelations highlight the close relationship between business and government, especially in highly lucrative industries such as the arms trade. Employees from BAE Systems (manufacturers of the Eurofighter Typhoon), MBDA (makers of missiles), Babcock (defense contractor working on Trident nuclear submarine replacement), and MSI (gunnery systems producer) have all taken senior level roles within the MoD. BAE systems, the second largest arms company in the world, has had more than 10 executives seconded to the MoD and the arms sales unit of UK Trade & Investment (UKTI) in the last year. The MoD’s Equipment and Support Branch, which has a £14 billion annual budget to buy equipment for the armed forces, hosted nine BAE executives in senior positions, the investigation by the Guardian found. UKTI Defence and Security Organisation, another government department, had four secondments from BAE, two from MBDA, and two from Detica, a cyber-security specialist acquired by BAE in 2010. While on secondment, salaries are paid by the company and not by the government department they join. Personnel exchange between business and government works in the opposite direction as well, with 13 civil servants having been seconded from the MoD to outside organizations, including cyber-security company Templar Executives, Lloyds Banking group, arms firm QinetiQ, defense think tank the Institute for Security and Resilience Studies (ISRS) and the BBC. Speaking to the Guardian, Andrew Smith of CAAT said, “Arms companies already enjoy a significant and totally disproportionate level of government support, and these kinds of secondments only make it more so. “All too often we’ve seen the government’s actions aligned with the interests of big business, which is particularly concerning when the businesses involved produce weapons,” she told the Guardian. The Guardian’s revelations come in the wake of the HSBC tax avoidance scandal in which the revolving door between financial institutions and government has also faced scrutiny. Lord Green, the former head of HSBC, came under the spotlight for having taken the role of Minister of State for Trade and Investment immediately after leaving the bank. Leaked documents allege that during Green’s tenure as Chairman of HSBC from 2006 to 2010, he oversaw the orchestration of industrial scale tax evasion for drug dealers, international criminals, dictators and terrorists. Lord Green stood down from a senior position in the banking lobby group The City UK on Saturday.